Actual scenes of the bloody battle of Monclova. 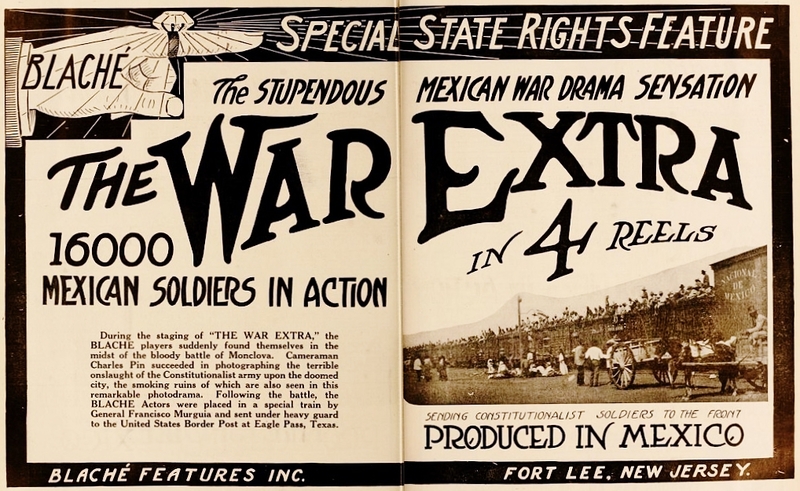 Combined with a strong story of love and adventure, staged in the very atmosphere of war which it demanded, places the four part drama, “The War Extra,” produced by Blaché Features, in a class by itself. In order to stage this remarkable drama in the most effective manner it was necessary to send a company of Blaché players to Eagle Pass, Texas, and thence across the border into the middle of the Mexican war zone. During their stay in Monclova the great battle which left that city a mass of smouldering ruins took place around them and was made a part of the photodrama. The leading character of the story is a war correspondent sent by “The Herald” to get “war news,” and to get it at any cost. The battle of Monclova gives him his great opportunity, and in spite of the fact that he is attacked by Mexican outlaws as a spy and finally driven to the United States border, where he is rescued in the nick of time by a large band of cowboys and the U. S. Border Patrol, he succeeds in wiring his great news to the paper and scoring a “scoop” which gives him both fame and fortune. Intimate and interesting scenes connected with the publishing of a war extra by a great American newspaper, follow the arrival of the war correspondent’s account of the great battle in New York. Every department of the paper is immediately set in motion and the excitement is intense from the time the first news of the battle reaches the editorial rooms until the “extras” are sent broadcast throughout the country. Twenty minutes before press time the Herald has received no news from the front in Mexico, where the interest of the nation is centered, and the editor is desperate. He listens to the pleading of the ambitious cub reporter, Fred Newton, and orders him to Mexico, with instructions to send back real news, regardless of the censors. Accompanied by a telegraph operator assistant, Fred boards a steamer for Key West. He is fortunate enough to pass a battleship and transports bound for Vera Cruz, and communicating with them by wireless he gets some live news for his paper before he has reached the Mexican border. Flushed with success he pushes into Mexico by way of Eagle Pass, Texas, and succeeds in reaching the center of the Constitutionalist activities at Monclova where he builds a shack and runs a wire of his own to the nearest telegraph line. While delivering supplies to the shack, Dolores, the adopted daughter of a Mexican storekeeper, is set upon by outlaws and her rescue by Fred makes her his devoted friend, but also causes him to be hated by the men he opposed. Prevented from accompanying the main body of the army, Fred and his telegrapher go on a scouting trip. They hear firing and, climbing a tree, witness the great battle of Monclova through field glasses. When the defeat of the Federals by the Constitutionalists is assured, they ride back to the shack and wire the important news direct to their paper. At the Herald office all of the machinery of the issuing of a great daily paper is set in motion as the news of the battle is received from Fred. The story is edited at the copy desk, set up by linotypes, made up in the forms, and stereotyped and placed on the presses. As the papers are distributed and the bulletin boards announce the scoop of the “young reporter on the firing line,” Fred’s future as a newspaper man is assured. But, as the dispatch is being received and published in New York, the outlaws, reinforced by Mexican irregular troops who have been told that the Americans are spies, attack the shack which is vigorously defended. Dolores attempts to stop the bandits and, failing, rides to the border to summon assistance. She enlists the aid of a large band of cowboys who arrive at the shack in time to engage the bandits in a fierce battle and rescue the now wounded Fred and his companion and make a dash for safety over the American line. A wild chase, in which many shots are exchanged, is about to end disastrously for the Americans just as they begin to cross the Rio Grande to United States soil, but the American regulars appear upon the scene and fire a volley across the river which sweeps a score of Mexicans from their horses and drives the rest to cover. As Dolores dare not return, Fred persuades her to accompany him to New York and an enthusiastic welcome by his newspaper friends is quickly followed by his marriage to the beautiful little maiden, who is received with open arms by his mother and sister. 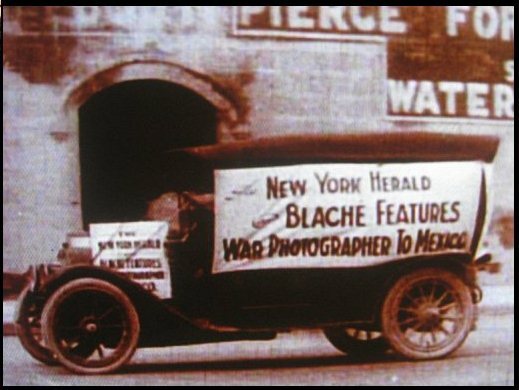 Herbert Blaché of Blaché Features, Inc., has announced a four-reel picture entitled “The War Extra” which contains scenes taken at Fort Lee, N. J., Herald Square, The Mallory Line Steamship Docks and The Statue of Liberty in New York, Key West, Florida, Galveston, El Paso and Eagle Pass, Texas and Piedras Negras and Monclova, Coahuila, Mexico. 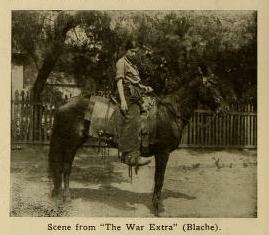 In a four-reel drama entitled “The War Extra,” Blaché gives a peep behind the scenes of a newspaper. Productor: Blaché Features. Director: Harry Schenck. Intérpretes: Vinnie Burns, Kenneth D. Harlan y Edgar de Pauw.